Say goodbye to multiple spreadsheets, email threads, and last minute phone calls. Focus on knocking out your tasks, we’ll help you stay on track and get through the planning journey! Log in any time to see what to do next and how much progress you’ve made. Knock out the next thing on your list and keep moving forward. Quickly check off completed items off your list. See how many tasks you’ve already completed. A gentle nudge so you can catch up on missed tasks. Check how many more tasks are on your list. Our task management software can be as simple or detailed as you like. Use the pre-populated tasks and add your own to create a custom checklist. 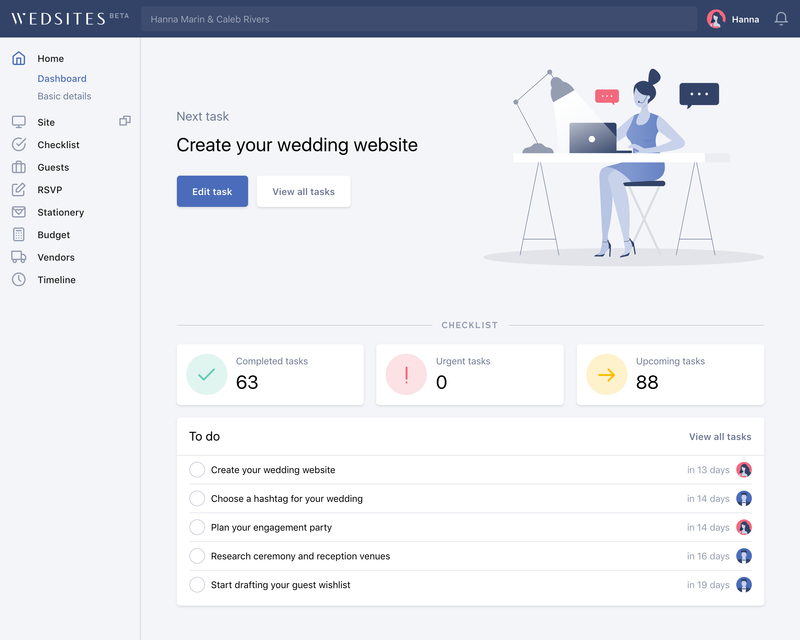 You can even collaborate and delegate tasks to your partner, bridal party, and even your wedding planner to keep everyone on the same page. You’ll have peace of mind knowing no small detail has been overlooked. Everyone knows planning a wedding is a lot of work. We’re here to lend you an extra helping hand to keep you organized with your planning so you can pull off your dream wedding. We’ll even send you progress reports to show you how much you’ve accomplished and what you need to take care of next! Preloaded with the most common wedding planning tasks for modern couples. Deadlines are automatically assigned based on the amount of time you have to plan your wedding. Receive updates from your digital planner so you don’t miss any deadlines or payments - just like a real planner would do. Don’t do it all alone. Get your planner or bridal party involved with your planning and assign specific tasks to them. Your dashboard will quickly indicate how much progress you’ve been making with your wedding planning. Get email reports to help you along the way. Need a bird’s eye view? Quickly switch between list and calendar views to see what tasks you need to knock out in the months leading up to your wedding.